I have written a number of posts on this blog about sea level rise and failing glacier systems in the Arctic, in Greenland, and in the Antarctic. I have taken care to point out that each and every study that comes out on glacier failure is more grim than that last, and that every new time-line is more accelerated than the last. Some of those timelines call for sea level increases of up to three feet by 2050. Stop and think about that for a minute: That means that we’d have to see an average gain in sea level of one inch per year through 2050 for that prediction to come true. And of course, that would be an average. 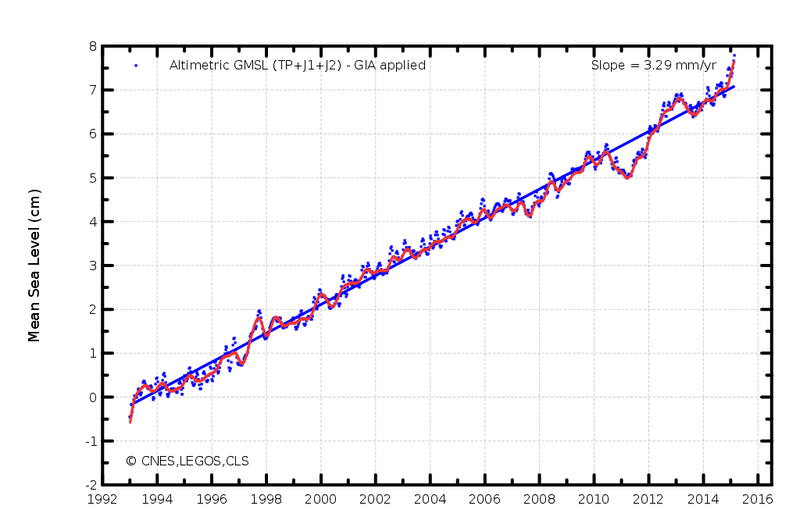 If sea levels were to rise by that much, we’d have to see them rising now and we’d expect that increase to accelerate. For instance, we would be seeing just a few millimeters per year now but also see a trend that would see increases of inches per year in a thirty years. 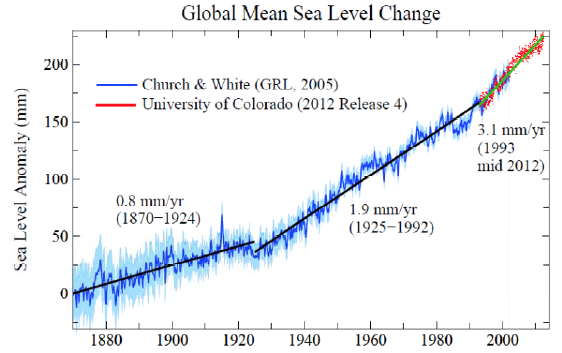 Thing is, that trend is exactly what we are seeing: an exponential rise in sea level. In the graph below (I need to pause here and acknowledge the always-excellent RobertScribbler blog for its post on this same subject and for posting these graphs), which was produced by Dr. James Hansen of NASA, you can see the rate of sea level increase. In the early years of the industrial era–from 1870 to 1925, it was a gentle increase of less than one millimeter per year. Then, in about 1925 the rate of increase more than doubled to about 1.9 millimeters per year. I stayed at that rate of increase until the early 1990’s, when the rate of increase again shifted into a much higher gear at a sustained increase of 3.1 millimeters per year. Note what is happening here. We were rising at 0.8mm/year for–well, we don’t know how long we’d been doing that because tide gauges were not sufficiently precise. But we do know that the second leg, at 1.9mm/year lasted juts under 70 years. Now, it seems the third leg might be over after just under 20 years, because sea level increase has again shifted into a higher gear starting in 2010. There are two sources of data we can point to (and, again, credit to RobertScribbler blog for his original work in aggregating the data and pointing out the trends). First, there is a study published just a week ago in the scientific journal Geophysical Research Letters in which study author Shuang Yi concluded that the global mean sea level (GMSL) has been rising by about 4.4mm/year for several years now. Why does it take a study to conclude that? Because the vast amount of data available on the topic is full of lots and lots of “noise” generated by such things as cold current upwellings and El Nino cycles (cooler water shrinks ever so slightly, decreasing sea surface levels and warming water expands ever so slightly, increasing sea surface levels). The fact that a very capable study has sorted all the background noise out and found sea surface increase rates even faster than expected is an affirmation of the exponential increase pattern that appears to be in place. Finally, there is the satellite data on sea level increase–the AVISO data–which shows an astonishing increase over the past six months or so. The AVISO data is reflected in the chart below (and, again, while the chart is from AVISO, it is RobertScribbler that posted it and gave it prominence in this context). Note that AVISO data says that in the last six months global means sea levels have increased by a centimeter. If sustained, that means that we are not at a point of gaining more than one inch of sea level per year. Look at the above chart carefully. You will note that, first, the period covered (1993 to 2015) affirms the rate of increase shown in the first chart at the beginning of this post. Then you might notice that the increase was pretty stable until 2010, when sea levels dropped suddenly and then sprinted up again. If you were to draw a line from January 2010 to where the measurement is now, you would arrive at a slope of over 20 millimeters in a bit over five years, or about the 4.4mm that Dr. Yi asserts we are experiencing. How long will we stay at this level of increase? Well, the 1992-2010 leg was less than a third of the 1925-1992 leg. Extrapolating, it seems we will stay on this course for perhaps a year more before shifting to a yet higher gear. After a few more cycles at this rate of acceleration, the sea-level increase charts will be close to straight up, which is what is required if some of the increase projections are to be met. Can we project what the next rate of increase will be? Well, aside from the short-term AVISO data (and we’ve seen a lot of variability in that measurement), it is difficult to make a prediction. The numbers in the Hansen chart are not particularly helpful. They do show a steady increase–from 0.8 to 1.9 to 3.3 to 4.4 millimeters per year, and form this we can predict that the rate of increase from 2016 to 2018 will be about 5.5 mm per year, and from 2018 to 2019 will be about 7mm per year, and during 2020 will be about 12 mm per year. This rate of increase means that we should be seeing a steady rate of 1 inch increase per year in 2021, with rate of increase of as much as 2 inches by 2023. Can we make these predictions with any level of confidence at all? No. But by 2020 (and that’s just five years away), we should have a much, much better feel for the overall rate of increase. And if the numbers above are anywhere close to right? Then we will see epic disruptions of coastal communities and overall economies, and we’ll see it quickly. At the above rate of increase, much of Miami is unviable by 2030 (and no one is going to be loaning on it after 2020 if the above trend holds up). So, yes, we’re seeing big things happen very quickly in a trend that accelerates as it goes. That is what exponential means. Hey Howard! I’m sorry, but the meaning of your message escapes me. Dizzy from what? Regardless, good to hear from you!